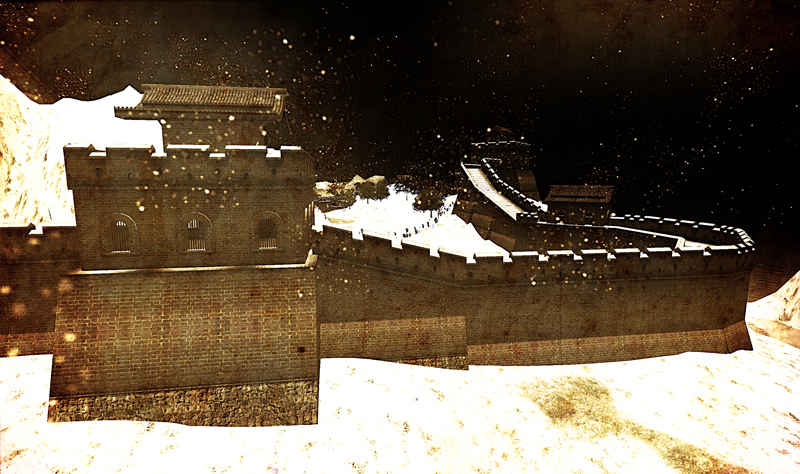 Last week the winter snows melted from an amazing place called Mao in Second Life. If you haven’t heard of this sim, or better yet, if you’ve always wondered what it would be like to walk the Great Wall of China, this place is a must-see. When you arrive at the main entry building, cross the bridge and begin walking the ramparts (if you’re a curious cat like me, walk down to the water to get a closer look at the boat). 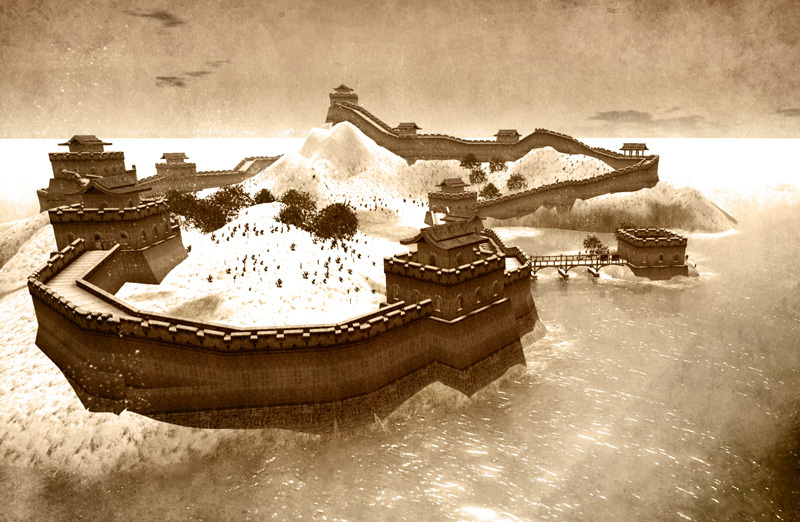 The thick, well-textured walls march ponderously up and down the sim’s rolling hills, with guard stations at each peak to capture the surrounding views. I must admit, I was glad to have seen this place before the snows melted. Something about the contrast between dark skies, swirling snowflakes, and soft mounds of white made the setting so much more magical — a perfect backdrop to a photo that Bobby had long been envisioning: the deadly snow scene in the first “Kill Bill” movie. This scene is certainly the one most people think of when they recall the movie. But did you know that this blood-spattered snowy moment, not to mention many other aspects of Kill Bill, were inspired and heavily influenced by a Japanese manga and film? Yep… long before Quentin Tarantino’s hit, the original vengeful female character was known as Lady Snowblood. Lady Snowblood (修羅雪姫 Shurayukihime) is a classic 1973 Japanese film based on the manga “Lady Snowblood” by writer Kazuo Koike and artist Kazuo Kamimura. It follows the story of a woman assassin who seeks revenge on a band of thugs who destroyed her family. A family is attacked by criminals who kill the father and brother, and brutalize the mother. Mom is thrown into prison, from whence she plots revenge the only way she knows how: by getting pregnant with a child that she hopes will grow up to be a trained killer who will hunt down the bandits. Young Yuki quickly develops her skills as a calculating killer. Upon reaching adulthood, she makes a living as a master assassin, earning the name “Snowblood.” Her every waking moment is consumed with a single-minded goal: to comb the underworld for the remaining members of the criminal gang that destroyed her family, in order to exact her mother’s bloody revenge. Clearly the theme of this movie impressed Quentin Tarantino enough to influence many aspects of his Kill Bill movies — from the creation of several vengeance-seeking female characters, to its unique camera angles, not to mention overall stylistic approach. You didn’t think it was gonna be that easy, did you? You know, for a second there, yeah… I kinda did. So there I was, a little Neko in the middle of a snowy field at midnight. Since I’m not a killer kitteh, I decided to have some cosplay fun. But which character… O-Ren Iishi in her (in)famous white kimono, katanas crossed menacingly? 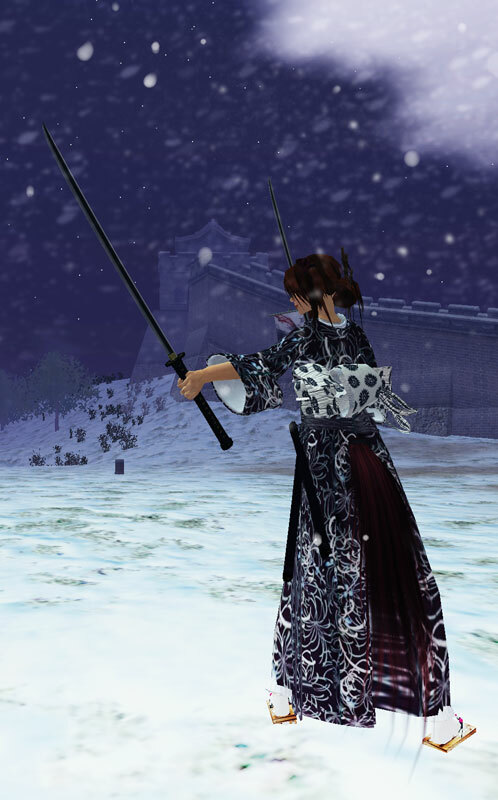 Or the more elegant Lady Snowblood, a long dagger tucked artfully into the sleeve of her silk kimono? Mmm… when in doubt, a cosplayer can always start with katanas. Not only did that allow me to give a nod to one of my favorite blog readers, Kyllie Wylie, in her “Dress Me Up” suggestion from a while ago, but it let me pay homage to one of my favorite Neko designers in Second Life: Loki Dancer of Dirty Lynx / Hanzo Blades. 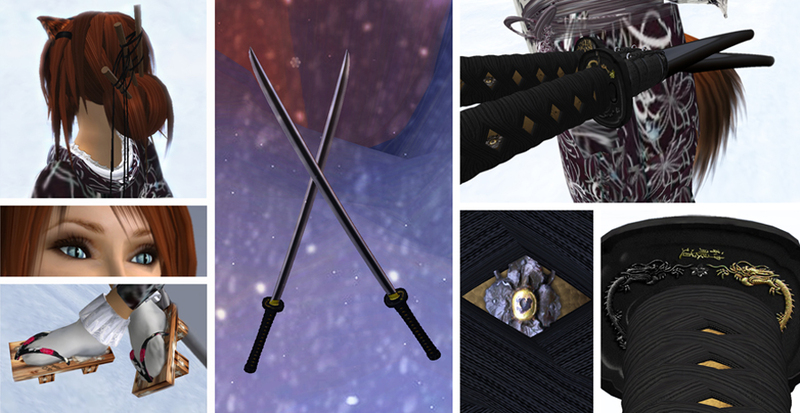 Loki’s katanas are quite simply the best I’ve found in Second Life. Their detail work, action, sound effects, simple-to-use HUD, and the attack animations (note to users: if the AWDS keys don’t work for ya, use your arrow keys) are all excellent. However equal praise goes to a guy named Mulaki Bracken, owner of a store called ‘Filthy Hobbit,’ where I found some outstanding poses for two swords (or katanas). If you’re a fan of wielding weapons, I’d encourage you to check out his unique poses. | Katana Poses | Filthy Hobbit: Red Sonja poses (the LM won’t take you to the store, so when you arrive, head for the red beacon. You’ll come to a pose store called “Serenade;” Filthy Hobbit poses are in the back left corner of the store). 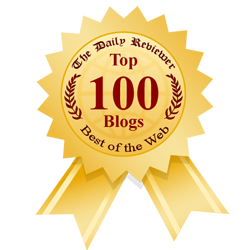 ~ by Stacia Villota / Virtual Neko on February 22, 2009. Sorewa iidesu ne Stacia! Doumo Arigatou! Eigo de nanto iimasu ka? Should turn it into a movie! Interesting post and beautiful artwork. Getting the outfit together and then the poses and then doing photoshop on it must have taken ages and the results are awsome.